Amidst the midterms, papers and parties, college students can find it hard to believe that just a 20-minute period can actually make our lives stress-free and easier. This was the message that was emphasized during the Art of Living Organization&#39;s talk, "Creating a Violence-Free Society." If that wasn&#39;t enough of a predicament, it is also human nature for us to constantly think about the things that we are told not to think about. These inner conflicts can cause us to feel immense stress and when the mind is disturbed, the effects can be seen in all aspects of life. Pragyapad went on to explain the four factors that affect our state of mind. The type of food we eat can be very important. As a "gas" for our bodies and brains, eating the wrong kind of food can alter our behavior. Secondly, the quality of sleep that each of us receive can have a heavy impact on our lifestyle. Also, our breathing pattern can change our mindset. It is for us to recognize that when we are in a state of fear or anger, we can breathe a certain way. Just as a disturbed mind can cause unwanted side effects, a calm mind can make everything seem just that much better. With a clear mind, one can make decisions, study and even play better. Pragyapad&#39;s key tip to getting a good night&#39;s rest is simply to work hard. Another technique to having a stress-free mind is meditation, which he defined as the "art of doing nothing." In 20-minutes of meditation, someone can get the same amount of rest as four hours of sleep. 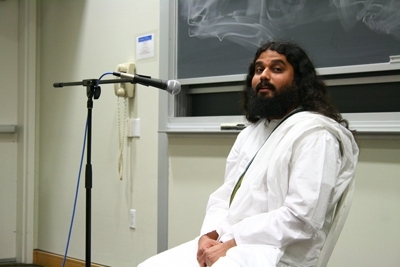 When asked what he thought about during meditation, Pragyapad replied that he would simply "observe whatever happens in the body." So why don&#39;t more college students take advantage of the benefits from a simple meditation? "Because they think meditation is anti-enjoyment," said Pragyapad, who insists that this is far from the truth. For Pragyapad, a calming mind allows him to handle his frustrations and even help his grades, while studying less. Meditation doesn&#39;t even require you to necessarily go anywhere exotic, as was evident from our group meditation in a classroom. He does warn, however, that first-time meditation can lead to a sensation of sleepiness from the calming of the mind, which "passes in a few minutes." 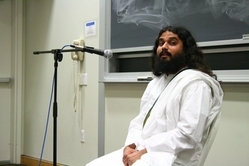 In regard to the recent "epidemic" of violence on high school and college campuses, Pragyapad sees meditation and other stress-relieving techniques as a means to help promote a stress-free university environment. The second step is to reach out to those people who don&#39;t know how to handle their emotions. Pragyapad says that "most of us can curb our violence tendencies; others cannot." Realizing this, we must reach out to everyone, because as Pragyapad says, it "doesn&#39;t require many to make hell for all of us." Using the methods of stress relief and meditation that is promoted by the Art of Living Organization, these individuals can learn how to deal with stress and find alternatives to such violent tendencies. Since the shooting at Virginia Tech University and suicide on the UCI campus, Matthew Scharpnick, a student at the Paul Merage School of Business and participant in the Art of Living Organization, says that the "whole foundation is putting forth an effort in the university [setting]." Scharpnick continues that "with things like the Virginia Tech shooting, you can&#39;t say for sure, but maybe, if he had the tools [of meditation and breath exercises], things could&#39;ve been different." Marissa Camilon, “Create a Violence-Free Society,” The April 16 Archive, accessed April 19, 2019, http://april16archive.org/items/show/1136.